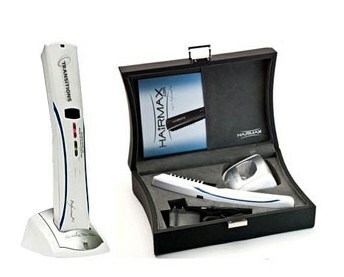 Low-level laser hair therapy is a revolutionary non-invasive breakthrough for men and women suffering from hair loss. What you can achieve with low-level laser hair therapy is thicker, fuller, shinier and healthier looking hair. Laser hair therapy is an easy, safe, and painless treatment with no known side effects associated with it. Developed in Europe, laser therapy can improve hair shaft quality, and volume while prolonging the life of hair color and improving hair colors and perms. It was discovered that it is effective when combined in a multi-therapeutic hair loss control and prevention program. Laser hair therapy is a non-surgical approach to treating hair loss and thinning hair for men and women. It is a proven method that uses low-level laser energy, also referred to as “soft” laser light to treat and control thinning hair. Laser hair treatments for hair loss is a revolutionary, breakthrough that is non-surgical and allows you to achieve the appearance of thicker, more, shinier, and healthier looking hair. The success of laser hair loss treatment depends on the individual. It is recommended to begin laser hair loss treatment as soon as a person sees signs of thinning hair. Generally, individuals in the early stages of hair loss tend to have better results. Low-level laser therapy treatments utilize therapeutic soft low-level light lasers which deliver light energy directly to the scalp. With low-level laser hair therapy, you can achieve thicker, more full, shinier, and healthier looking hair. Avvair’s proven low-level laser hair therapy treatment programs are designed to maintain a healthy head of hair. Promotes fuller, shinier, softer, thicker hair. Laser Light Hair Therapy is a non-surgical, non-chemical scientific approach to treating hair loss and thinning hair. It is a medically tested, effective and proven method using low-level laser energy, or “soft” laser light to effectively treat and control problem hair loss. Laser hair loss treatment for hair loss is a revolutionary, non-surgical breakthrough for men and women suffering the devastating effects of hair loss. With laser hair loss treatment, you can achieve the appearance of thicker, more full, shinier, and healthier looking hair.